Gstaad is a world-class ski resort in Switzerland and if you choose to travel to Gstaad this winter, you won’t regret it. The prestige and luxury perfectly blend in the alpine authenticity of the village. Although you will see perfectly dressed people and many sports cars on the streets, you will still feel like you’re in a fairy-tale snow paradise. Forget about a budget holiday and cheap accommodation, as here you will only find upscale hotel facilities and chalets. Despite the luxury appeal, Gstaad is also known as an excellent ski resort which offers great ski pistes for beginners and intermediate skiers. Also, this is a great destination for families as there are many fun activities for children including playgrounds, petting zoos, and fun winter parks. In fact, 30% of the total visitors are families. Gstaad is located in the southwest of Switzerland, right on the border to the French-speaking part of the country. You can easily reach this region by train or by car from the nearest airports, as well as, the train stations connected to the European railway network. The nearest airport with the best international connections is the Geneva airport, located around 155 km from Gstaad. Once you arrive at the airport, you can continue your journey by public transport or private Geneva airport taxi. At the airport, you can board a train to Montreux and change to the railway link to Gstaad. Before your arrival, check the timetable and availability online. The most convenient way to travel to Gstaad and start your winter holiday stress-free is to book a private Geneva airport transfer. This is a door-to-door transfer arranged prior to your arrival. The taxi driver will wait for you at the airport and take you directly to your accommodation in Gstaad. This is especially convenient if you’re carrying your own ski equipment, so you don’t have to transfer it from one vehicle to another. The taxi fare for the ski transfer from Geneva airport to Gstaad is fixed and charged by vehicle. No matter how much luggage and ski equipment you carry, it is included in the price. You can choose a vehicle of your choice which will fit your needs and pay online or in cash to the driver. Gstaad is the perfect choice for true ski enthusiasts as this is one of the most diverse Swiss regions for winter sports. There is 250 km of trails between 1,000 and 3,000 metres height. Another benefit is the guaranteed snow. People travel to Gstaad from autumn to spring. Thanks to the glacier ski area in Bernese Oberland, winter sports fans can enjoy skiing and snowboarding at the end of October until the start of May. 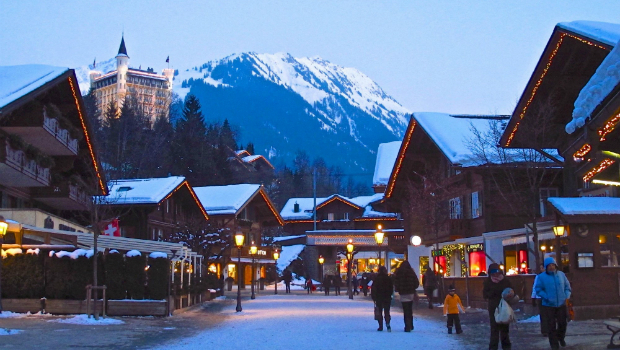 Skiing and snowboarding are the most popular winter sports activities in Gstaad. The runs are perfect for beginners, as well, as for advanced skiers and snowboarders. The ski area is divided into six sectors with more than 70 ski lifts. Freestyle skiers can visit the Gstaad Snow Park located on the Hornberg in Saanenmöser, which offers three areas with different levels of difficulty. Another challenge freestylers can’t miss is the Pays d’Enhaut. Thanks to the international schools in this area, Gstaad has become a magnet for the rich and famous. From royal members to billionaires, this authentic ski resort attracts the world’s elite during the ski season. Especially around Christmas, the resort welcomes renowned business people, as well as, celebrities from the world of art, fashion and film. Back in the 1960s, Elizabeth Taylor, Richard Burton, Roger Moore and Brigitte Bardot, were the celebrities who helped turn Gstaad into a prime Swiss ski destination. The grandiose Palace hotel located at the top of the town, overlooking the streets below, is a synonym of luxury and great style. Today, you can easily spot Anne Hathaway, Valentino, Madonna on the ski pistes, soaking up the winter sun. Although Gstaad is not known as a party hotspot, there are many bars on the slopes where you can relax after skiing. There’s nothing better than enjoying the winter sun while sitting in a deck chair with a hot drink in your hands. Gstaad has a wide offer of mountain huts with great sun terraces and good music in the background. They all have the famous Alpine charm and majestic panoramic views of the mountains. If you have energy by the end of the day, then you should hit the floor and go party. The central meeting point in Gstaad is Richi’s pub which offers a real British taste. Other bars where you can have fun and enjoy live music are Rialto Bar and Stall Bar Chlosterli. However, the best party is at the exclusive GreenGo club at the Palace hotel. This legendary nightclub has been the “place to be” since the 1970s and the best parties are organized here today, as well.